Weather apps have made it convenient for all of us to quickly get a glance at the temperature and conditions of our general location. However, they’re not exactly the conditions at your actual home location, so there’s a certain degree of variance in those figures you read on your smartphone. 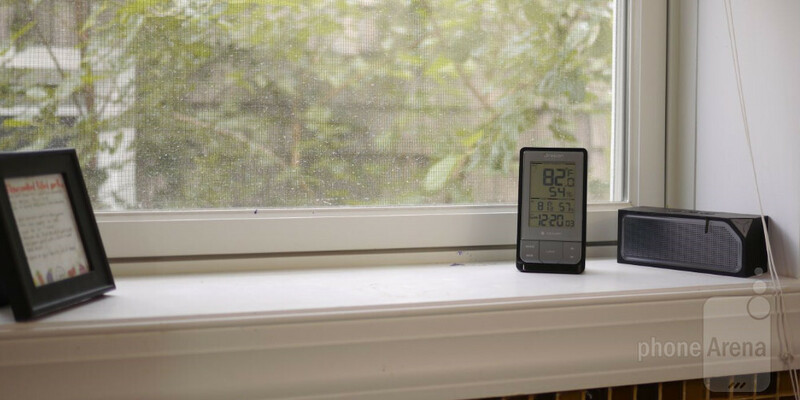 In-home weather stations aren’t necessarily new, but the Oregon Scientific Weather@Home Thermo Plus is an easy-to-use, Bluetooth connected weather tracking solution that delivers relevant weather information at your specific home location. From a cursory glance, the Weather@Home Thermo Plus looks like your ordinary digital weather station – much like the variety you’d find in both specialty and general retail stores. Unlike the Netatmo Urban Station we checked out a good while ago, the Weather@Home Thermo Plus appears more conventional in design. Almost too typical actually, making it tough to distinguish that it’s a “smart” weather station. Essentially, the main unit is dominated by an LCD display that shows us the time, temperature, and humidity levels. There are buttons lining the bottom section of the façade, which allows us to turn on its backlighting, change its modes, scroll through the list of connected remote thermo-hydro sensors, and view low & high readings of the unit. Our particular review unit comes with a single remote sensor, but the Weather@Home Thermo Plus has the ability to be connected to up to 5 sensors. The main sensor accepts 2 AA batteries, whereas the remote sensor is powered by a single AA battery, which all three batteries are included with the packaging. Unfortunately, the manufacturer doesn’t provide details on how long they’ll last. Naturally, the main sensor is meant to be placed somewhere indoors, like in the living room or kitchen, so we can quickly glance at it to see the temperature, time, and humidity of the room. Meanwhile, we placed the remote sensor outside, resting along a window, where it records the temperature and humidity outside – though, it can be technically be placed indoors as well in another room. Luckily, the sensor has a range of 98 feet. Using the Weather@Home Thermo Plus Weather@Home app for Android, which is also available for iOS devices too, we’re able to connect to the unit with no issues at all. As for the app itself, it’s a pleasant option when we’re not close to the main base unit to view all of the weather information, as it presents to us all of the same information, but on our smartphone of course. Now, if consider yourself as a weather junkie, you’ll eat up at how the unit gathers data and puts it into a line graph – where we can see how the values change throughout a period of time. It’s one thing when your phone’s default weather app tells you it’s 80-degrees outside, but sometimes that’s just not the case at your exact location. Thankfully, the Weather@Home Thermo Plus is more accurate in compiling actual weather data that’s isolated to the area outside our front door. Knowing what it offers, is it something that you’ll really need? In our opinion, this isn’t a must-have item, but rather, it’s one of those easy gifting ideas you can give to a friend. With a price tag of $39.99, it won’t bite you in the wallet – so that’s comforting to know.